Remember when Bush was president, and the media celebrated whistle blowers? Things are sure different now that the Dems run everything. Check out this cartoon from Charlotte Observer cartoonist Kevin Siers, slamming James O'Keefe and Hannah Giles, the duo who exposed corruption inside the Dem-friendly ACORN organization. Memo to Kevin Siers -- when even Jon Stewart mocks the mainstream media's coverage of ACORN, maybe it's time for you to stop defending the indefensible. A skinny white prostitute and her pimp turn up at the office of Barack Obama’s favourite US “poverty action” charity ACORN (Association of Community Organisations for Reform Now). They want advice on a few problems, like how best to bring over a “couple” of - well, 13, actually - underage girls from El Salvador to work in this brothel they’ve got planned, without attracting too much heat from the authorities. How can they get a mortgage, how should they deal with their tax affairs, how do they legitimize their immoral earnings and so on? ACORN’s expert advisers are more than happy to oblige, as this hilarious video - first posted at the BigGovernment site - reveals. Hilarious because, of course, the footage is a stitch-up. It was filmed with a hidden camera and acted out by two very brave young US investigative journalists - Hannah Giles and James O’Keefe, keen to expose the dubious moral standards of the radical left organisation. Since then they have struck twice more. First at one of ACORN’s Washington DC offices. Most recently in New York - where, among the advice they were given was to hide their illicit gains in a tin and bury it in their back yard. A neat little scoop which has already caused several heads to roll at ACORN, and, as Toby Harnden reports today has led the US Census Office to break its controversial links (for chapter and verse see Stephanie Guttman’s blog on this) with the notorious organisation. But is it really any more significant than that? Despite the antique media's best efforts at downplaying the mushrooming ACORN scandal, New York Attorney General Andrew Cuomo and New York City Council President Christine Quinn, Democrats both, are moving quickly to freeze local funding to this criminal enterprise. State Attorney General Andrew Cuomo yesterday launched an investigation into pork-barrel grants given to ACORN by state lawmakers, as City Council Speaker Christine Quinn froze all city funding earmarked for the scandal-scared community-activism organization. The actions by the Democratic officials followed release of a shocking undercover video that showed employees at a Brooklyn ACORN office giving illicit financial advice to activists posing as a pimp and prostitute who wanted to start a brothel. The agency was among several ACORN affiliates, including offices in Baltimore, Washington and San Bernardino, Calif., exposed in the hidden-camera sting. On Monday, the US Senate voted overwhelmingly to block federal funding to the community group, while Brooklyn District Attorney Charles Hynes opened an investigation into the local office in response to a report in The Post. A spokesman for Cuomo said the attorney general would seek to make sure pork-barrel grants directed to ACORN by state lawmakers were spent on tax-preparation and loan-counseling services, as intended. "We are now closely monitoring that investigation to preserve the integrity of state funds," Cuomo spokesman Richard Bamberger said. "We will be reviewing member-item contracts involving ACORN in light of the district attorney's investigation." A source told The Post that Cuomo is considering freezing any funds set aside for ACORN until after Hynes completes his investigation. A spokesman for state Comptroller Thomas DiNapoli said the state's financial watchdogs would also flag future payments to ACORN for extra scrutiny. Meanwhile, Quinn went a step further, suspending all ACORN grants sponsored by City Council members until Hynes concludes his investigation, according to one city lawmaker Quinn told about the move. Some ACORN spokesthing naturally offers a mealy-mouthed excuse but it's pretty clear the videotaped incidents at ACORN offices around the country are having an effect on this outlaw group so closely connected to Democrats. House and Senate Democrats will do their best to quash any investigation but if the states begin pursuing this independently there may be some hope this mob can finally be de-funded. Could Andrew Cuomo phone his brother Chris over at ABC (All Barack Channel) to tell him about this scandel? Curiously, no one over there seems to know anything about this. House Minority Leader John Boehner introduced legislation Tuesday that would break all federal government ties with ACORN -- the Association of Community Organizations for Reform Now. And Sen. Mike Johanns, R-Neb., wrote Attorney General Eric Holder requesting an investigation by the Justice Department. 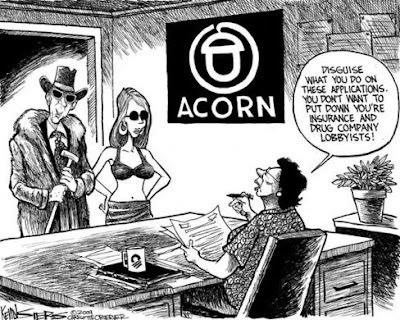 He cited reports that ACORN may "have been engaged in illegal activity" by aiding and abetting tax evasion, prostitution, human trafficking, fraud and conspiracy. The Justice Department did not immediately comment on Johanns' letter. Cisneros, who worked regularly with ACORN as HUD Secretary, would later plead guilty to lying to the FBI to cover up a political embarrassment. Perfect choice. Townsend is so inependent that she called the stories of ACORN’s frequent involvement in voter fraud a “desperate smokescreen maneuver” masking an extensive coast-to-coast GOP push to disenfranchise hundreds of thousands of voters in 2008. Stern heads SEIU, which has a very cozy relationship with ACORN. ACORN controls or significantly dominates several SEIU chapters. And Stern hand-picked ACORN’s Wade Rathke to direct SEIU’s nationwide organizing projects. He could not be more independent. And Podesta runs the Soros-funded Center for American Progress, which has been coordinating the public defense of ACORN this summer. He might be even more independent than Andy Stern. Glad to see that ACORN is taking this all so seriously. ACORN - Who Funds the Weather Underground’s Little Brother? Summary: The Association of Community Organizations for Reform Now (ACORN) has become America’s most prominent leftwing community group. It is also implicated in vote fraud schemes from coast to coast. ACORN aims to give America change that socialists can believe in – by any means necessary. It is deliberately organized to avoid scrutiny. But with an FBI probe underway, millions of dollars in back taxes owing, and a racketeering lawsuit pending, it may finally have to answer for its many misdeeds. "It’s a very different editorial process when you have 24 hours to fill as opposed to 22 minutes," Banner said, explaining why ACORN hasn’t yet fit in the evening newscast. A left-leaning community organizing group says it has no contracts with Minnesota that would be impaired by Gov. Tim Pawlenty's directive to cut off state money. Pawlenty on Wednesday ordered a review and suspension of public contracts with the Association of Community Organizations for Reform Now, known as ACORN. The potential 2012 presidential candidate says no state money would go to ACORN unless legally obligated. ACORN is under fire after a hidden-camera story alleging illegal activities by some of its workers. ACORN deputy political director Kevin Whelan says there are no present contracts that would be affected in Minnesota. Whelan says Pawlenty's move "seems like it's motivated by politics or publicity." Kirstin Gillibrand is ACORN’s Trojan horse. She is a hollow soulless being who will help America’s enemies destroy us to stay in power. Tuesday she proved she puts herself above our country. When the Senate voted 83 to 7 to order HUD to cut off funding for ACORN two thoughts came to mind. All the “Nos” were Democrats since Democrats are enemies of real America -no surprise to that. Of course Durbin and Leahy were there but Kirsten Gillibrand (D) NY? What’s the story? Lurking just beneath the surface is Gillibrand’s connection to the most malignant force in New York and America’s politics, the Working Families Party (WFP). Before being elected to Congress Gillibrand was a generally apolitical liberal working in Washington, and initially she tried being a Blue Dog, even voting correctly a gun rights issue. Gillibrand’s Blue Dog days ended when her Senate seat was handed to her. She promptly sold her soul to the Working Families Party the anti American political arm of ACORN. When she voted to continue funding ACORN, a group could end up being collapsed as a RICO organization, she was ORDERED to by the Working Families Party. Gillibrand voted to give herself campaign money through the WFP. The Fishwrap of Record has finally seen fit to tell its readers about the latest ACORN scandals (the San Bernardino tapes, which don’t get a mention, are beyond belief). True to form, the New York Times commits grievous sins of omission that whitewash the paper’s own role in deliberately covering up ACORN’s illicit activities before Election Day last November. Soon I think the ‘paper’ that most NYTimes reporters will have to deal with, is the lightly waxed version with the circle that they have to center the McDonald’s cheeseburger on. Now that ACORN has lost its Census Bureau contract and Senate funding, grassroots conservatives are trying to decide what's more outrageous – the organization's wrongdoing, or the media's blatant reluctance to cover it? Fox News viewers weren't shocked: They've known about the scandal since the leading cable news network broke it last Thursday. But the LA Times, the first major newspaper to offer an editorial on the latest ACORN scandal, is actually ahead of the curve compared to the rest of the mainstream media. Fox News, 19stories; CNN, 3 stories; the New York Times, the Washington Post, and the Wall Street Journal – one story apiece. "I don't even know what they passed," Pelosi told The Post yesterday. "What did they do? They defunded it?" Obama and his supporters are just like Hitler and Stalin when it comes to whistleblowers. They also despise freedom of speech, the right of citizens to defend themselves, the right of citizens to actually keep most of their money and the right to be free of tyranny. I though Bush was bad about all this, but Obama is infinitely worse. They're even trying to reinflate the diversity housing bubble. Next up on the corrupt lib Fox takedowns: SEIU.